Commentary by Neil A. Lieb, photo from his archive. On the upper left-hand corner, there’s a crane. That crane we used to haul the steel up to the top, the rebar, the jackrods. That’s all we used it for. You didn’t tie up the other hoist, you used that one. I think it’s called a jack crane. It was an electrically operated crane. The railroad tracks are on the bottom, that’s the end of a box car in the lower right. That doorway—that’s used when you’re loading grain after the thing was all over with. When I first started, I pushed the Georgia buggy. It’s probably the worst job in the world because it’s very physical. They weighed 1000 pounds. At Alta, I progressed to laying steel. All the new hires always got to push the concrete because that was the hardest work. There was a big turnover when you started out because pushing Georgia buggies wasn’t very much fun. 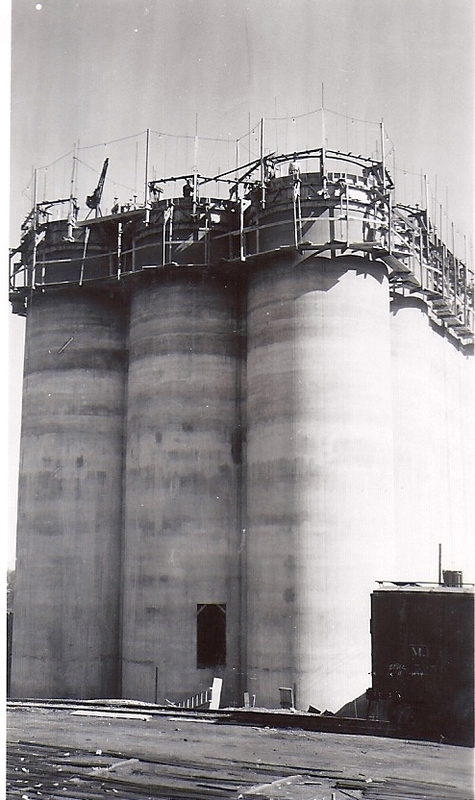 This entry was posted in Photography, The Companies, Their Work and tagged Alta Iowa, architecture, Business, construction, grain elevator, photography, slip-formed concrete.